Winco WDM009-203 Ardesia Linza White Melamine Square Bowl 5"
TigerChef > Dinnerware > Melamine Dinnerware > Melamine Serveware > Melamine Bowls >< Square Bowls > Winco WDM009-203 Ardesia Linza White Melamine Square Bowl 5"
✔ 17 oz. capacity✔ Color: white✔ Break-resistant, highly durable✔ Dimensions: 5"
$24.99 Thunder Group PS5005RD Passion Red Square Melamine Bowl 11 oz. - 1 doz. $24.99 Thunder Group PS5005V Passion Pearl Square Melamine Bowl 11 oz. - 1 doz. $24.99 Thunder Group PS5005W Passion White Square Melamine Bowl 11 oz. - 1 doz. 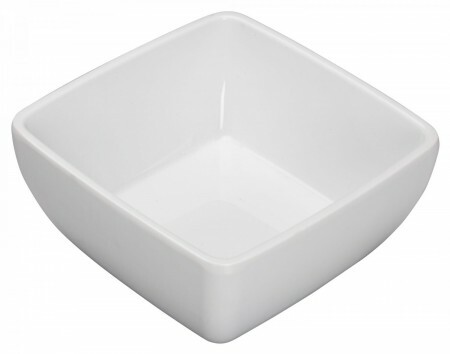 Provide a sleek, modern style to catered events, weddings, and other functions with the Winco WDM009-203 Ardesia Linza White Melamine Square Bowl 5". Designed with a pristine white finish and an elegant smooth surface, this bowl beautifully frames your food, highlighting its colors and textures. This exceptionally durable item easily complements any setting and is perfect for use in both casual and formal settings. Made from high quality melamine, this square bowl captures the look of delicate china without being vulnerable to heat and breakage.